CXRacing-Front Mount Universal Intercooler 31"x12"x4", 4" Core: 24"x12"x4"
Design Engineering 080130 CryO2 Front Mount Intercooler Sprayer, 16" x 5"
CXRacing-Twin Turbo Intercooler 27"x13"x3.5", 3.5" Core: 24"x7"x3.5"
Aluminum Liquid Water to Air Intercooler.- Core Size 10"x9.5"x4.5"- Overall Size 20"x10"x4.5"- Two 3" Air Inlet Outlet- Two 0.7" Water Inlet Outlet- 4.5" CoreThis is a Huge Liquid Water to Air Intercooler, Perfect for High Power Applications, Supports 1000+ HP. 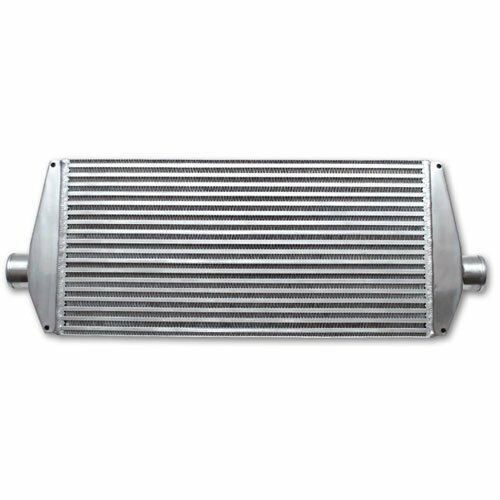 Front Mount Turbo Intercooler.- Bar & Plate Aluminum Intercooler- Core Size: 24x12x4- Overall Size: 31x12x4- 3 Inlet & Outlet- 4 Thickness CoreThis is a very common Intercooler, works for many applications. It has 4 thickness core, Support Big HPs. Whether you are faced with the challenges of space limitations, a lack of access to cooling air flow or you are looking for extreme intercooler efficiencies, Bell's Liquid/Air intercooler system can offer an attractive alternative to Air/Air intercooler systems. The Liquid to Air system works by transferring the charge air heat (from turbocharger or supercharger) to a liquid coolant, this coolant is then pumped to a remotely located heat exchanger where ambient cooling air removes the heat. The obvious advantage with this system is that you can optimally position your heat exchanger in the cooling air stream, regardless of the location of the engine or associated space limitations. The Liquid/Air intercooler system presents obvious advantages for mid and rear engine applications where space and airflow issues can often prevent the use of an effective Air/Air intercooler system. By allowing the heat extraction process to be essentially placed anywhere on the vehicle, you have the ability to go from struggling to find even marginal airflow, with a compromised intercooler size, to having the best intercooler size for your application. For drag racing, autocross or tractor/truck pull applications the Liquid/Air system can provide sizeable competitive advantages. Through the use of chilled coolant, you can reach intercooler efficiencies well in excess of 100%, unleashing dramatic performance gains. Bell Intercoolers has extensive experience in designing Liquid/Air intercooler systems for everything from 400hp import drag cars to 5000hp+ tractor pulling applications. All Bell intercoolers Liquid/Air systems are pressure tested to your specifications to ensure the best possible reliability and performance. Vibrant Air-to-Air Intercooler is designed to provide superior cooling efficiency and enhanced engine performance. It is constructed from highly durable aluminum bars and plates. 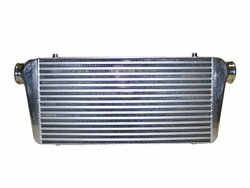 This intercooler core features high air flow rate and comes with an end tank. Overall Size: 31"x18"x4",Core Size: 24"x18"x4"
Built-in mounting bracket on intercooler for easy install. matching Intercooler inlet and outlet size, provides the best air flow from Turbo to Throttle body. CryO2 Intercooler Sprayers mount directly to the front of air-to-air intercoolers or aftercoolers and serve as a way to vent the liquid CO2 directly on to the cooling fins thus, enhancing the performance of the intercooler by more than 50% eliminating intercooler heat soak. NOTE: This component must always be the last in the CryO2 system as it vents the liquid CO2 charge. 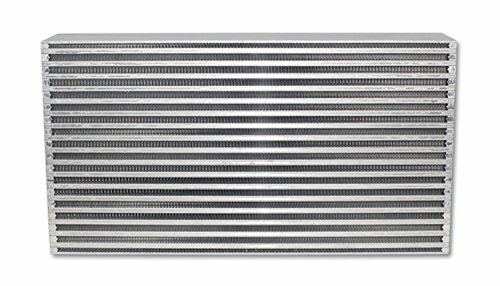 Vibrant Air to Air Intercoolers feature bar and plate construction that is designed to deliver maximum cooling efficiency while minimizing pressure drop. Furthermore, their overall strength and durability make them capable of handling even the most extreme, high boost, race applications. 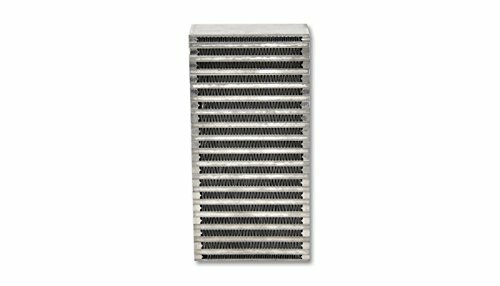 Traditional intercoolers with a tube and fin construction have a limited cooling capacity, while our Vibrant bar & plate Intercoolers deliver significantly cooler, denser air to your engine. 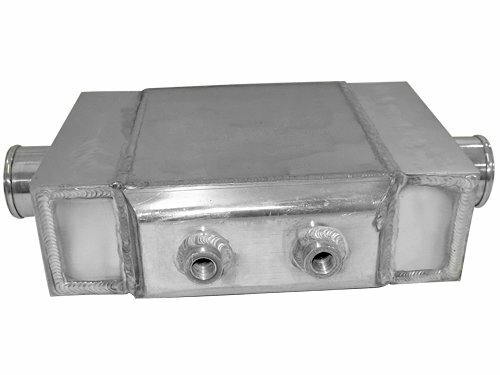 Vibrant Intercooler Assemblies feature tig welded cast aluminum end tanks in three core sizes. All intercoolers with end tanks are pressure tested to ensure a leak free assembly. 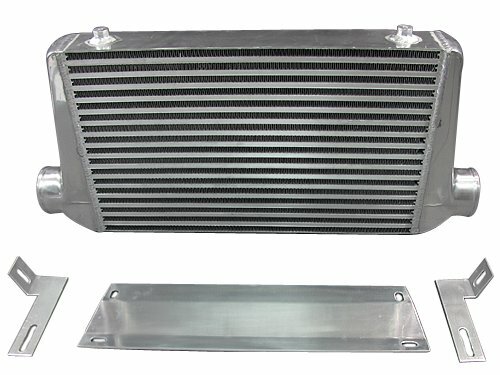 Intercooler Core; 6" x 11.80" x 3.00"
Twin Turbo Front Mount Intercooler.- Bar & Plate Aluminum Intercooler- Core Size: 24"X7"X3.5"- Overall Size: 27"x12.5"x3.5" - Two 2.5" Inlet, One 3" Outlet- 3.5" Thickness CoreThis intercooler is perfect for many twin turbo application. Like for Mustangs. the core is 3.5" which is big but still fits. 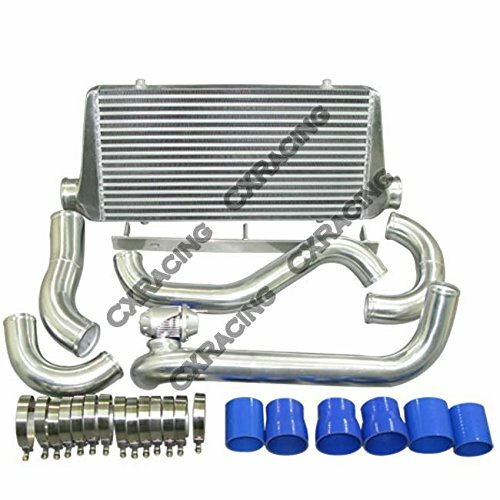 CXRacing FMIC Intercooler kit For 2003+ Audi A3 8P, Double Core.Intercooler + Piping + Silicon Hose + T-Clamp + Bracket. 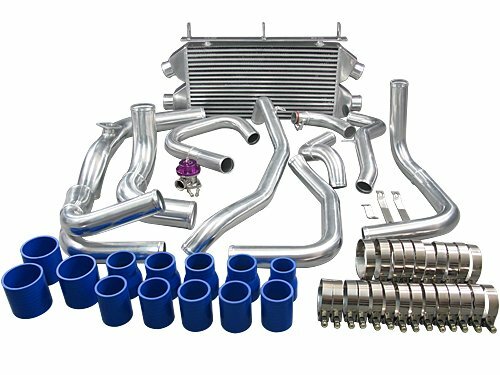 Bottom Core Thickness=4".Total Height=12".Inlet & Outlet=2.5".This Kit Features CXRacing's Innovated and Latest Double Core Intercooler Technologies. Maximizing Cooling Core Size While Still Keeps Factory Bumper Support and other Factory Parts, Offers the Most Efficient and Largest Cooling Capacity without Cutting or Removing Other Parts. Double Core Intercooler Utilizes All Available Space under the Bumper Support Bar and the Space Between the Bumper Support and AC Condenser Unit. 2.75" Cold Side and 2.5" Hot Side Aluminum Piping. Fits Stock Sensor.Intercooler is 4" Thick Bottom and 1.75" Thick Top. 2.5" Inlet and Outlet.This kit is Excellent for Performance Gain and better Cooling. It is a complete new design from Ground up, simple and easy to install.Professional Nice Looking. This Kit Features CXRacing's Innovated and Latest Double Core Intercooler Technologies. 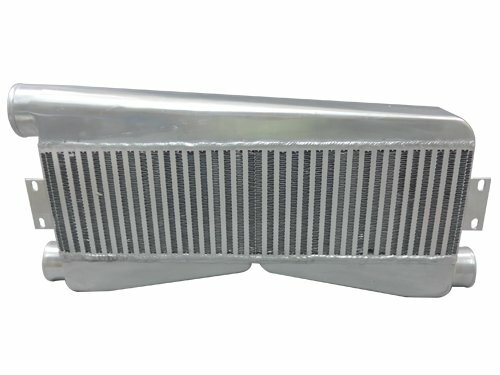 Double Core Intercooler Utilizes All Available Space under the Bumper Support Bar and the Space Between the Bumper Support and AC Condenser Unit. 2.75 Cold Side and 2.5 Hot Side Aluminum Piping. Fits Stock Sensor. Twin Turbo Intercooler 27.5"x16"x3.5", 3.5" Core: 24"x10"x3.5"
Intercooler Core; 22" x 11.8" x 4.5"
CXRacing Twin Turbo Intercooler Kit For 1990-2001 Mitsubishi 3000GT GTO / Dodge Stealth with Stock TD04 Twin Turbo Setup.Completely New Design, Using Dual Core Intercooler, 2-in-2-out, Each Turbo Has Its Own Cooler.This Kit Fits Perfectly, Piping Are Complete Re-Designed, Intercooler Comes with Mounting Bracket. No Cut.Rear Turbot Outlet Pipe Has Silicon O-Ring Seal and Mount Bracket, Securely Holds High Boost without Leak.Driver Side Pipes are Designed to Keep Stock Oil Cooler.Comes with BOV.All Aluminum polished 2.0mm thick pipes all the way, matching Intercooler inlet and outlet size, provides the best air flow from Turbo to Throttle body.2.75" Cold Pipes and 2" Hot Pipes.Intercooler + Bracket + Piping + Silicon Hose + Clamp + BOV.Bar & Plate Intercooler.Core Size: 22"x11"x3".Overall Size: 30"x11"x3".3" Core, 2.5" Twin Inlet & outlet. Completely New Design, Using Dual Core Intercooler, 2-in-2-out, Each Turbo Has Its Own Cooler. This Kit Fits Perfectly, Piping Are Complete Re-Designed, Intercooler Comes with Mounting Bracket. No Cut. Rear Turbot Outlet Pipe Has Silicon O-Ring Seal and Mount Bracket, Securely Holds High Boost without Leak. Driver Side Pipes are Designed to Keep Stock Oil Cooler. 2.75 Cold Pipes and 2 Hot Pipes. 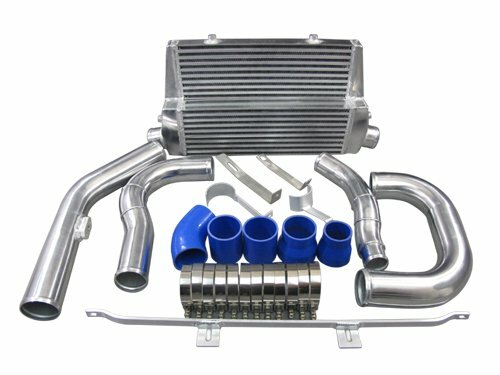 CXRacing Upgrade Intercooler Kit For Toyota Supra MKIII with 1JZ-GTE with Stock OEM Twin Turbo.Intercooler + Piping + BOV + Silicon Hose + T-Clamp.Bolt on fit. 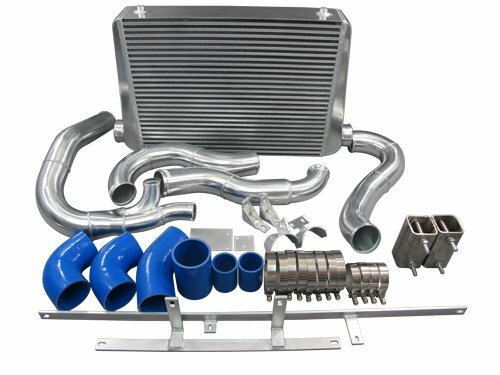 this kit is one of the best kits on the market, simple design, easy install, bolt on, high air pass flow, almost no pressure drop.We are also working on a LOT of SUPRA products (1JZ-GTE Single Turbo Intercooler kit, 7MGTE Stock Intercooler piping kit and Upgrade FMIC kit, 7MGTE Turbo Upgrade kit, just to name a few. All these products are bolt on, Dyno tested, Track Proven.- Bar & Plate Intercooler.- Core size: 24"x11"x3".- 3" Inlet & Outlet.This kit is a bolt on kit for 1JZ-GTE on a 86-92 Supra MK III, MA70 MA71 Chassis with 1JZ -GTE TT engine Swap, or JDM GA70 JZA70.Highlights of this kit:Big intercooler, 31x12x3 overall size.- Bolt on, with Aluminum Bracket, Nice Looking.- 2.5" Aluminum Polished Piping.- 3" Air Intake Pipe.- Kits includes silicon hoses and T-Clamps.- Comes with Free BOV.- Support Big HP application.Items Included on this kit:- Intercooler.- Aluminum Mounting bracket.- Aluminum Polished 2.5" Piping kit, with silicon hoses and T-Clamps.- 3" Air Intake Pipe.- BOV. Bolt on fit. this kit is one of the best kits on the market, simple design, easy install, bolt on, high air pass flow, almost no pressure drop. 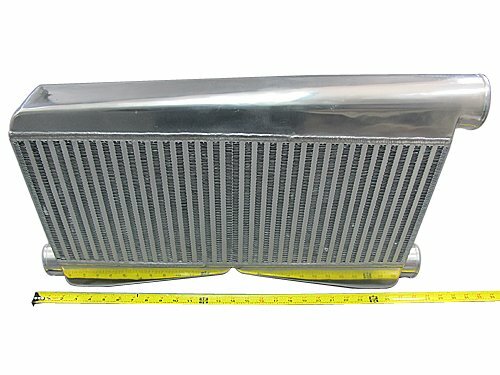 Bell Intercoolers manufactures all of their intercooler cores right here in the USA. 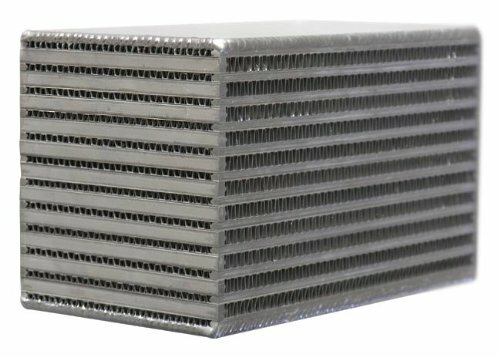 These high quality, high performance intercooler cores are pressure tested prior to shipping and come with a one year warranty against workmanship failures. Utilizes a bar and plate design for the highest efficiency and performance. A well-designed Air-to-Air intercooler system represents the most cost efficient and reliable method of reducing intake charge temperatures in turbocharger and supercharger applications. With no moving parts the Air-to-Air system provides essentially maintenance free reliability, just this side of bulletproof. Couple this with Bell Intercoolers engineering and design expertise and you have a proven method for harnessing the potential of your turbocharged or supercharged engine. We know you're looking for the best intercooler system for your application, but best can mean many things. Best performance, best price or best design for a complex installation. People have come to expect the highest levels of performance from Bell Intercoolers. With solid engineering and design experience behind each of their systems you get the best in intercooler technology. But what if price is the key consideration? We can help there too. The same experience that allows Bell to design the highest performing systems also allows them to design a system that can handle the balance between the need for performance and the reality of a tight budget. Have questions about designing the best Air-to-Air intercooler system? Please contact us and let our team assist you with expert advice and information. 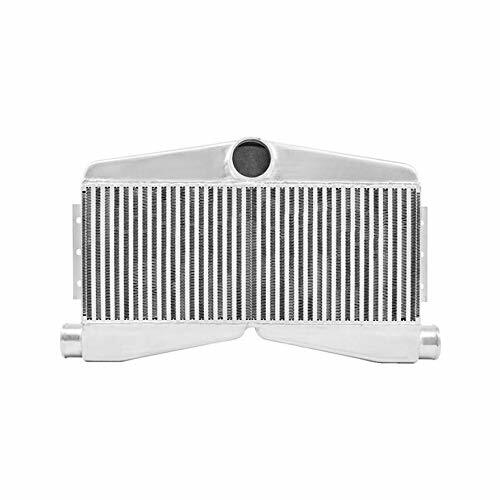 Our philosophy is to provide you with the best parts and best information to ensure you have the best intercooler for your application.